The Swing Wizzard is a unique looking golf aid like no other. It looks like the inventor took two clubs and connected them at the grip ends. It’s claim to fame is showing golfers what a balanced effortless swing should feel like; also builds muscle memory allowing for more consistency and accuracy. 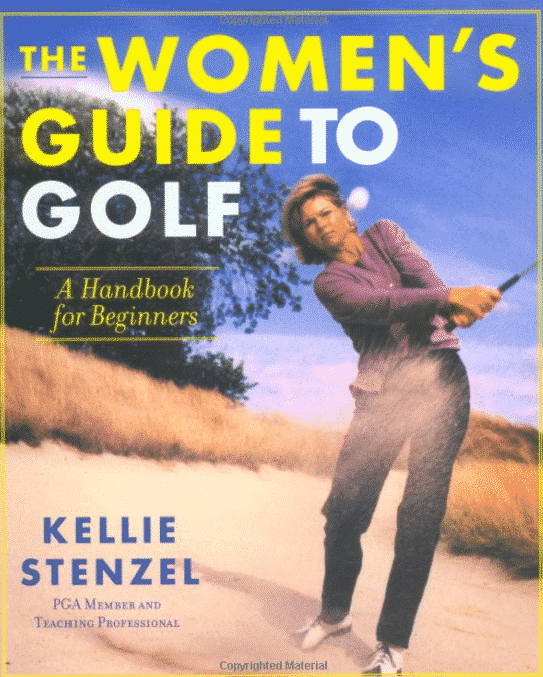 The Women’s Guide to Golf is a well-crafted and easy-to-understand golf instructional for women who are new to the game. Practice, practice, practice…is so important in golf. However, in some places the winter months make it hard. 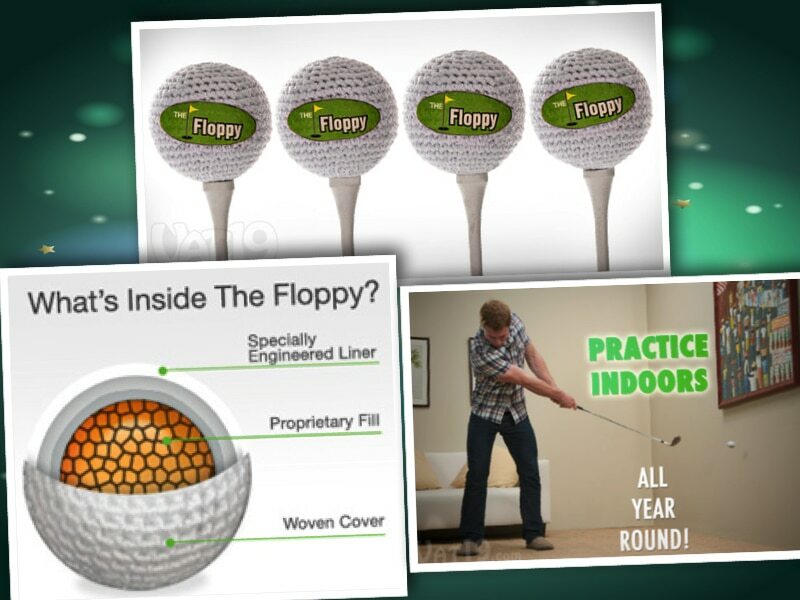 “Floppy the Indoor Golf Ball” allows golfers greater opportunity to practice in their home. “The Floppy” is a practice golf ball that feels like a ball but is soft enough to bounce off a window or a wall. It allows you to practice your short game shots, build confidence, gain touch and improve feel any time, anywhere. Ben Hogan, considered to be the greatest striker of the golf ball, would beat balls on the practice range until his hands bled. He once said that in a good round, he hit just three shots exactly the way he wanted. 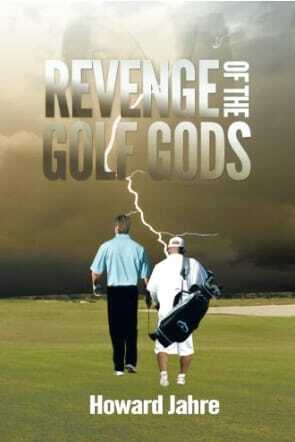 He understood that golf is more a game of misses than a game of perfection. Until a brash young amateur attempts to prove him wrong. When Gordon Howard, trust fund baby and amateur golfer par excellence, comes to the sudden realization that his cushy job working for his father’s mega hedge fund has been a colossal mistake, his world free-falls into a tailspin. Searching for fulfillment and meaning to his life, he throws caution to the wind and embarks on a mission to become a professional golfer on the PGA tour. His goal is to win the coveted US Open. Amidst the pressure of his level headed girlfriend to abandon his pipedream, Gordon is contacted by a man he has never met, who offers him what he has been desperately searching for, an infallible golf swing. But the price Gordon pays for such perfection is much more than he ever bargained for. The SSR Training Brace (Simple Swing Repeater) is designed to keep the angle formed between the lead arm and shaft at address the same throughout the swing (maintains the address ulnar deviation). You might be wondering with the wrist being restricted, does the device allow for the proper ulnar deviation, flexion and supination in the wrist at impact to produce “trailing” or “following” of the club head behind the hands aka lag? The SSR creator Pete Buchanan’s swing philosophy is different from the status quo because lag is something he doesn’t recommend. In his 16 years with John Jacobs School researching and watching tens of thousands of swings. Pete believes big changes in ulnar/radial deviation cause impact problems. 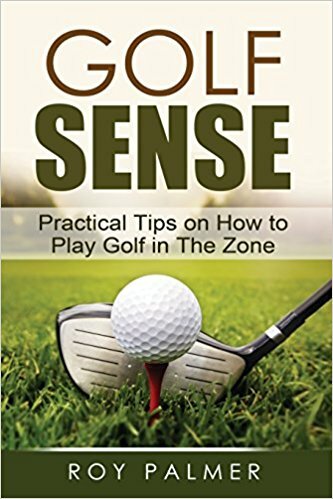 The innovative techniques in Golf Sense will help you get into the zone to breakthrough the performance limiting habits holding you back and let you take greater control over your game. You can do all this once you get into the zone, the ultimate state in which to play at your peak and take your game to levels beyond your expectations. 1. The Wedge Lean side is slanted so a forward leaning Wedge matches the angle. 2. There is a 7 iron lean and a vertical Driver lean side, too. 3. There is also a round side. 4. Then the magic happens! Flip the Impact Cube on its top and you have a side (the Wedge Lean) that is slanted toward you. Set the ball “under” the slant and it is the ideal tool for teaching an inside attack angle and preventing the “over the top” move. 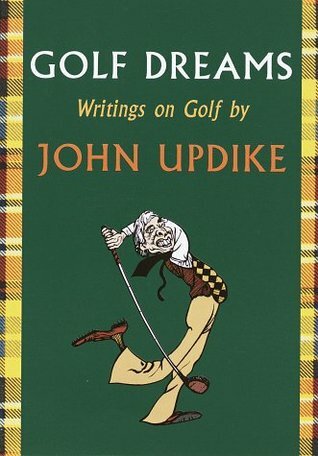 John Updike wrote about the lure of golf for five decades, from the first time he teed off at the age of twenty-five until his final rounds at the age of seventy-six. Golf Dreams collects the most memorable of his golf pieces, high-spirited evidence of his learning, playing, and living for the game. The camaraderie of golf, the perils of its present boom, how to relate to caddies, and how to manage short putts are among the topics he addresses, sometimes in lyrical essays, sometimes in light verse, sometimes in wickedly comic fiction. All thirty pieces have the lilt of a love song, and the crispness of a firm chip stiff to the pin. bradan is the Irish Gaelic word for the salmon, which was believed to gain wisdom from eating hazelnuts that fell into the stream from overhanging branches. The word also meant a broad hillside in Old English. The game of golf was born in Scotland, a land of rolling hills and salmon, and a little wisdom is no bad thing when you are playing the challenging courses there. All coaching pro’s express themselves differently but the bradan cards keep it brief and simple which is what I imagine the majority of golfers want. 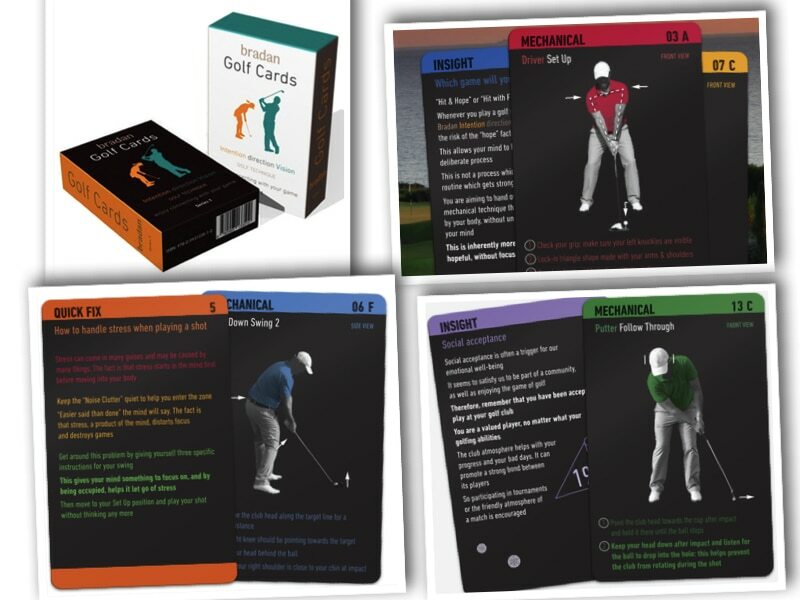 The cards are a worthwhile addition to golf lessons; a lot of what is covered in a lesson is hard to retain, so a quick reference to the cards on whatever aspect of your game you’re working on is useful. First published in 1935, with a revised edition in 1947. 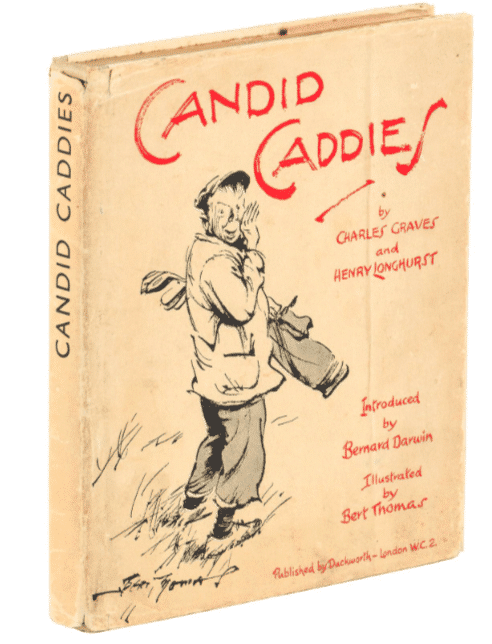 Golfing stories and cartoons told by caddies.